Japanese Episode 014: "Electric Showdown! 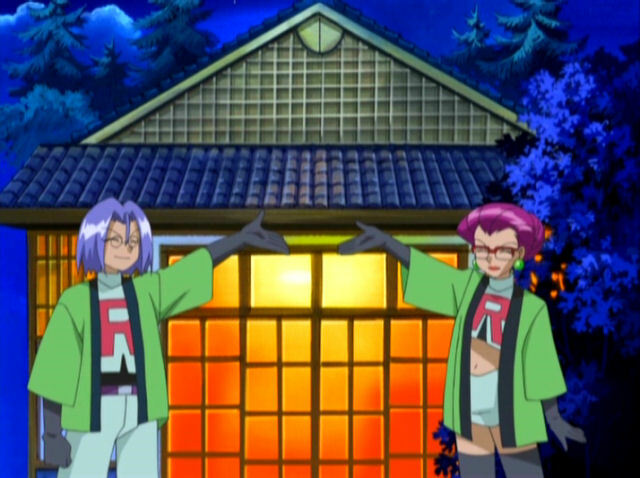 Kuchiba Gym"
American Episode 114: "Electric Shock Showdown"
After many trials and tribulations, the gang finally arrives in Kuchiba City! The gang decides to start off by resting up at the Pokemon Center where they witness a number of pokemon who are being treated for injuries sustained during their battle with the Gym Leader. Satoshi believes that his battle will end differently and marches toward the gym to begin his battle. When he arrives, the Gym Leader, Machisu, taunts Satoshi for not evolving his Pikachu and tells him how much of a baby he is. The battle between Machisu's Raichu and Satoshi's Pikachu begins, but before long, Satoshi's pokemon is beaten. 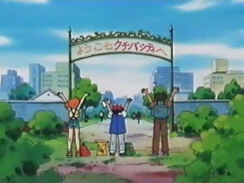 Pikachu is taken to the Pokemon Center where Joi presents Satoshi with a Thunder Stone. He's told that he can use the stone to make his pokemon evolve, but Pikachu expresses its desire to battle Raichu just the way it is. Satoshi happily agrees with this decision and works with Takeshi to figure out a way around Raichu's brute strength. After Satoshi's pokemon is healed, a rematch is held back at the Gym. This time, Pikachu uses the fact that it's faster than Raichu to confuse Machisu, enabling it to wear Raichu down. Pikachu is eventually able to defeat Raichu, earning Satoshi the coveted Orange Badge! Now that Satoshi has earned his third Gym Badge, he looks forward to what the future will bring. One of the major complaints that other fans and I have about the Kanto portion of the anime is how Satoshi wins most of his badges through a combination of luck, pity, and gratitude. Out of the eight badges in Kanto, Satoshi only wins three of them by actually KO'ing all the Gym Leader's pokemon; happily, the episode being compared here is one of them. I really have no complaints about the Gym Battle here. Having Satoshi win because his Pikachu knows some attacks that Raichu didn't due to it not leveling up properly is actually quite brilliant (especially for a Kanto battle), and the way the whole thing played out with Satoshi trying to decide whether or not to evolve his pokemon was great as well. Really, I can't find anything to complain about here; the whole episode's good, from start to finish. I also really enjoyed Machisu, "the Electric American." Though his nationality is never brought up in either version of the episode, the character, voiced by Fumihiko Tachiki, speaks Japanese with a very heavy American accent. He also peppers his speech with a lot of English words, making him one of the more unintentionally hilarious characters yet. Sure, he pretty much embodies every stereotype Japanese people have of Americans, but he somehow manages to pull it off without being overly offensive. The only real shame about this episode is that there is so much electricity flying around that the people in Japan had to significantly slow down large portions of the episode to adhere to the guidelines placed after the Episode 038 fiasco. The script in the dub isn't as bad in this episode as it was in the last one, but I suspect a lot of that has to do with the fact that a good half of Machisu's dialogue was already in English to begin with. The big "Pikachu decides not to evolve" scene is ruined with the inclusion of filler background music (there was silence there in the original), but otherwise the episode's pretty much intact. 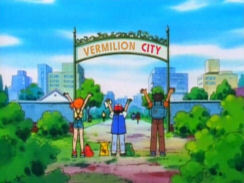 Now you know the big sign at the beginning of the episode didn’t say “Vermilion City” in the Japanese version, right? Pokédex: "Raichu; a mouse Pokémon of the electric element. Raichu is the evolved form of Pikachu. It can shock with more than 100,000 volts - enough to render a Dragonite unconscious." The Pokemon Zukan doesn't mention Kairyuu in the Japanese version; it just says that Raichu's power is able to disrupt power grids or something like that. Lt. Surge: "I enjoy playing with toys. But playtime's over." Originally, Machisu says that he doesn't need to even bother with electric attacks and that normal attacks should do just fine. Which is why his next two commands are the non-electric Mega Punch and Mega Kick. Joy: "You've got to think hard before using the Thunder Stone." Misty: "If you make Pikachu evolve, Ash, you can't change it back." Brock: "Pikachu will never be the same." First of all...what's with the robotic delivery of Joy's line here? I've seen planks of wood give more lively performances. Secondly...Brock's line here is a little different in the Japanese version. In that version, Takeshi tells Satoshi that "there are many ways to bring up pokemon...," giving a somewhat more neutral take on the situation, in my opinion, than Brock does. The dub, on the other hand, seems to imply that Pikachu's going to act totally different if it evolves, but, as we see in future episodes, there are plenty of pokemon whose personalities don't change when they evolve. Back when this episode first aired in the U.S., the idea of ouendan and importing games based on these cheerleading squads weren't something that Westerners really had going on, so the fact that the Rocket-Dan were dressed like an ouendan trio was probably lost on them. But we know better now, right? 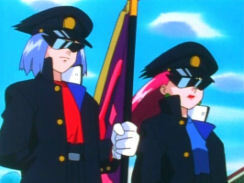 I'd also like to point out that this is the first time the Rocket trio would ever wear a disguise in an attempt to fool our heroes. It's also the first (and maybe only...?) time that one of our heroes actually recognizes them even when they have their costumes on. Unfortunately, everyone seems to get dumber as time goes on until we get to the point where the trio can pull a total Clark Kent and nobody's the wiser. ...is apparently based off the pose of the main character in the gag manga Aa! Hana no Ouendan (嗚呼! !花の応援団, "Hey! The Flower Cheering Squad"). Ash: "Your Raichu's way too slow, Surge. That's its weakness." 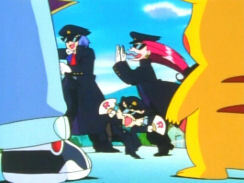 Lt. Surge: "O~K, Raichu. Give it a Thunderbolt. Shut it down!" In the Japanese version, Machisu doesn't just say "OK"; he actually says "Goddamn." In English. It's one of those things that sounds like a stupid Internet rumor but isn't, so I whipped up this video to prove it to you. I think it's pretty obvious why 4Kids changed it. Jessie: "What a shocking story." James: "That was quite a...tail." Meowth: "Me-owth! And now, you've both been...pun-ished. Hehehe." So maybe you were wondering why was a Koffing randomly in that scene? Well, in the Japanese dialogue, Musashi comments on how Pikachu used its tail as an aasu (アース, "ground"). Then, Kojirou says the same line but replaces aasu with Dogaasu (ドガース, "Koffing"). This prompts Nyasu to hit them both before telling them to "be more serious nyaasu" (ニャース, which is the Japanese equivalent of whenever Meowth would end his sentences with some kind of cat noise). The dub ignored the Koffing-related pun, but I really don't see how they could have worked one in. Oh well. You know those Next Episode Previews that dub watchers don't get? Well, in the preview for the next episode, Satoshi (who narrates a good 90% of the previews throughout the various series) actually mentions Sakaki by name, which I think is like the only time ever that the character has ever done that. Weird. Next Episode Previews aren't exactly considered canon, I guess, so I wouldn't use this to prove that Satoshi actually knows who this man is.